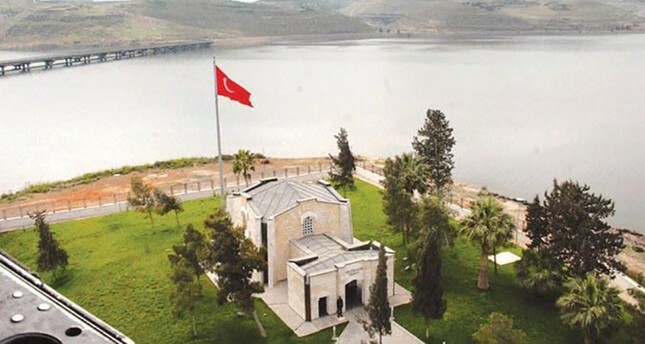 The tomb of Süleyman Shah will eventually be relocated to its original location after the area is completely liberated from the People's Protection Units (YPG) terrorists in northern Syria, Deputy Prime Minister Fikri Işık said Monday. Speaking on a live broadcast of TRT Haber newscaster, Işık said "Süleyman Shah Tomb was moved temporarily and will be moved to its final destination because it is Turkish land." Süleyman Shah, who died in 1236, was the grandfather of Osman Gazi, the founder of the Ottoman Empire. The legendary tomb has had three locations. It was originally located near castle Qalat Jabar in Syria's Raqqa until 1973, when it was moved up the Euphrates banks to Aleppo governorate, 27 kilometers (17 miles) from the Turkish border, to avoid being flooded. In early 2015, Turkey moved the tomb 22 km (14 mi) west of Kobani to protect it from the threat posed by Daesh terrorists. Under both the 1921 Treaty of Ankara and the 1923 Treaty of Lausanne, which broke up the Ottoman Empire into multiple states, the tomb remained as the property of Turkey, to be protected by Turkish guards. The 2003 Protocol between Turkey and Syria gave Turkey transit rights through Syrian territory to access the tomb in order to maintain and repair it. The tomb's land continues to be the sovereign territory of Turkey.